Detroit doesn't lack in offering a variety of things to do for the city's residents and visitors. No matter the season, there is always a game to attend, festival to enjoy, new restaurant to indulge in, or annual event to partake in. On September 22nd, an unseasonably warm first day of fall, and through September 23rd, thousands poured into Midtown Detroit to enjoy DLECTRICITY - a nighttime exhibition of art and light. In its 2012 inaugural year, Midtown Detroit, Inc. produced this bi-annual event welcoming local, national and international artists to light up the city with various art and light installations throughout the Midtown neighborhood. 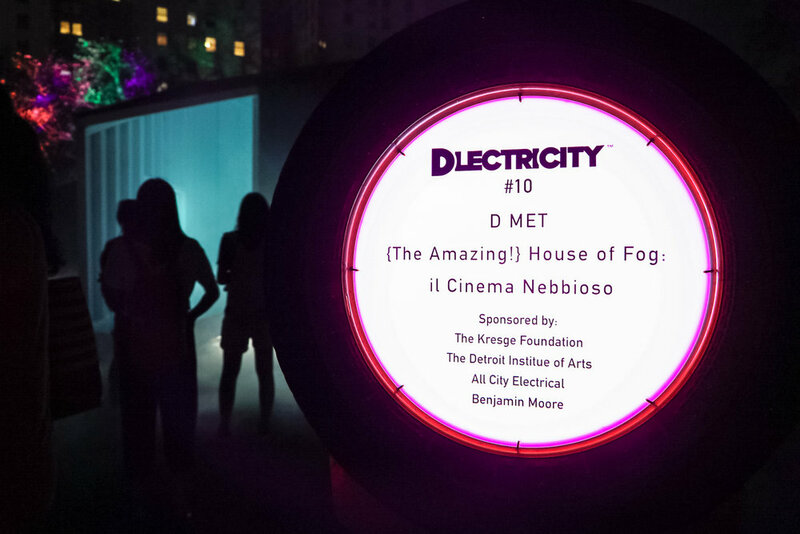 Bringing in 75,000 attendees in its first year and doubling in size in the 2014 event, DLECTRICITY has proven to be a fall favorite among Detroit and expected over 200,000 people for 2017. Skipping a year in anticipation for the launch of the QLine streetcar, DLECTRICITY 2017, presented by DTE Energy Foundation, brought forth exhibitions and installations from 36 artists showcased throughout the Midtown neighborhood from the Detroit Institute of Arts to the Museum of Contemporary Art. Detroit staples such as College for Creative Studies, Wayne State University, the Detroit Artists Market, the Michigan Science Center, the Detroit Historical Museum and the N'Namdi Center for Contemporary Art hosted indoor and outdoor art installations while local businesses extended their hours and offered themed-activities for attendees. From the 4-mile Light Bike Parade drawing in 1,500+ participants, to the Kresge Foundation kid-friendly Electric Park on the DIA lawn, to musical and painting live performances, there was something for everyone to enjoy! DLECTRICITY is a personal favorite because it brings city residents and visitors together to celebrate the creativity and life of Detroit. It's a weekend where art, light, design and architecture collide to challenge our creative thinking and way of viewing everyday objects in a different light. Just as architecture impacts the built environment, art and design have a profound ability to shape the public spaces we inhabit and our reactions to them. These photos capture just a glimpse into the exhibitions of DLECTRICITY. As a business centered on design and creating inspired workplaces, ISCG takes pride in celebrating forward-thinking, local creative arts and events! All photography by Morgan McDonald.